Magazines: South Africa can boast with some beautiful publications, which means the spreads are eye-candy deluxe! 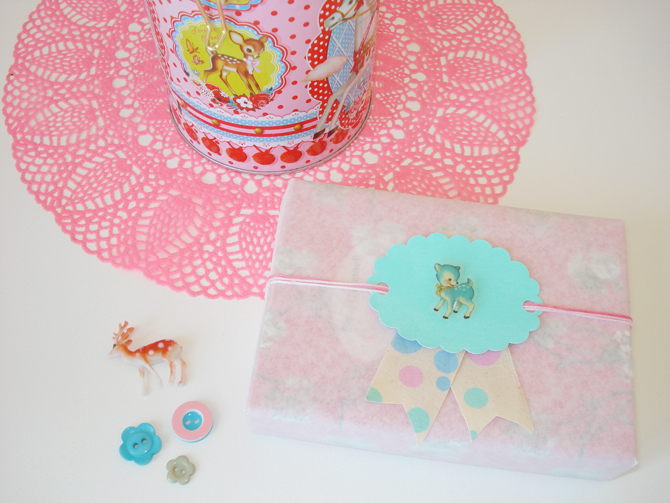 Cut out cute patterns or items. It's unique, bright and will be one of a kind. You can mount the magazine paper on some white or coloured paper and write your message on it. 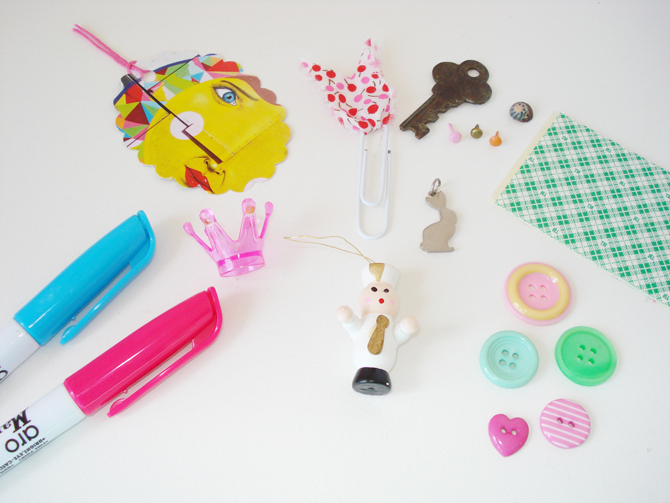 Random Stationery Suppliers: Give that poky corner shop a chance! Some of my favourite bits and pieces have been collected from stationery suppliers, who don't have the most crafty things in stock, but something of interest instead. Old fashioned paper clips, old photo corners, faded brown paper, all of these things can be converted into something cool and useful. Fabric or Craft Stores: This one might make you think - duh, we know that, but we often so focused on what we are looking for that we don't take time to look around and see what inspiration we can find from other crafts. Mosiac tiles might work if stuck on a card or hung as a small glinting mobile, fabric pens can transform plain, boring ribbon and scrapbooking paper has a multitude of uses. It can all be very tempting, so think ahead and plan what you would like to do so you don't spend those precious pennies on wasted supplies. South Africa has long had a shortage of really great creative supplies, but that has inspired a movement of DIY and lead to many creative folk having a job in the first place. 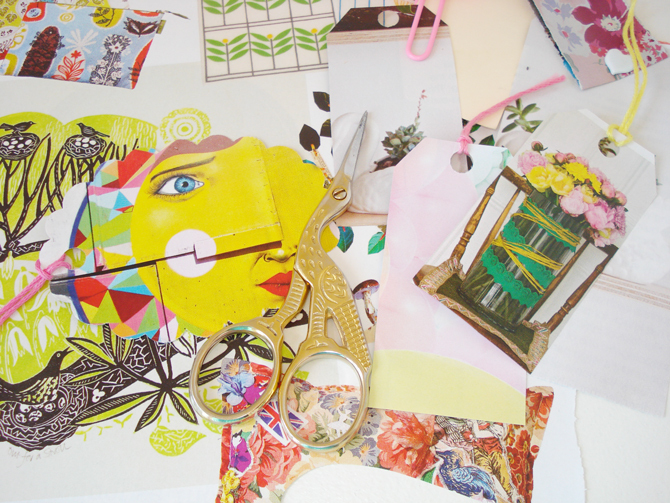 Local designers make and create wonderful stationery and cards and we are improving every day. Durban and some of the smaller towns still have a shortage of regular supplies, but keep you eyes peeled and you will be surprised what you might find. Markers: Fabric markers can work on ribbon or coloured markers are great for adding a bright message written on brown paper. Found Objects: An old key works for a house warming gift or a random shell as a bon voyage gift topper. Second hand shops often have odd collections of small, but useful items. Packaging: Some novel products come with cute additions. For example the pink crown in the photo came with an Easter egg, I am saving it for a little girl's birthday - to tie onto the gift. Old Accessories: Did that cheap charm bracelet or set of earrings break? Take a look and see what you can salvage. 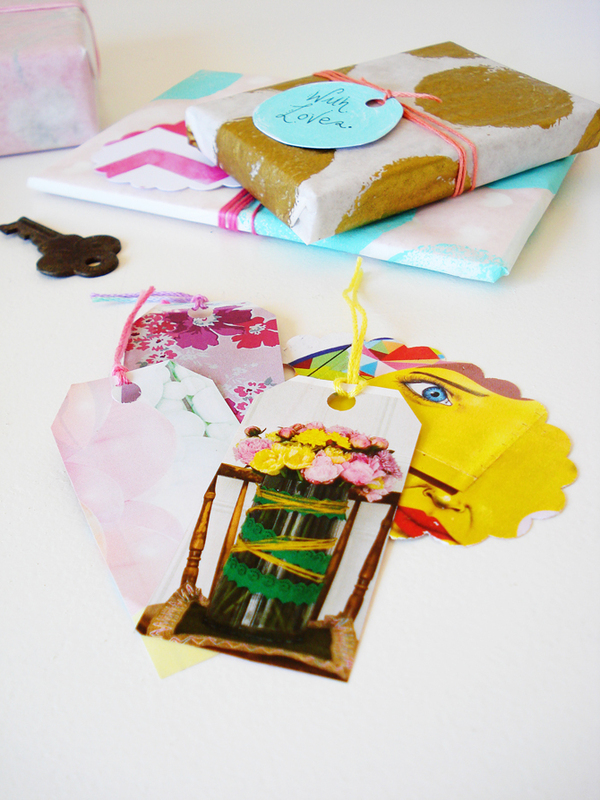 Charms work well when tied to a card or gift with string. Paper Clips: The office staple can be converted to a pretty clip with some ribbon, felt cut-outs or a paper shape. Cheap and really easy to find. Brads: These are traditionally for scrapbooking, but their much bigger cousin the split-pin is sold at Waltons and most other suppliers. To add some colour top it with a lick of nail polish. They work really well for creating dimension or putting together a bunch of keepsakes. Double-Sided Tape: No longer for putting up your bathroom mirror, this tape is perfect for giving a card or tag dimension and adding layers of pretty paper on top of one another. It adds instant visual interest. Paint: Craft paint is sold quite widely, even at CNA and some hardwares. It's super handy for changing the colour of things. Don't have the right button - paint a white one in the colour of your choice. Sponges: Those little white sponges that always pop out of medicine are quite annoying, but you can use them to make great patterns and textures on plain white paper. Grease-Proof Paper: You know that wrap you use in the kitchen for baking - well, it doubles as white wrapping paper. 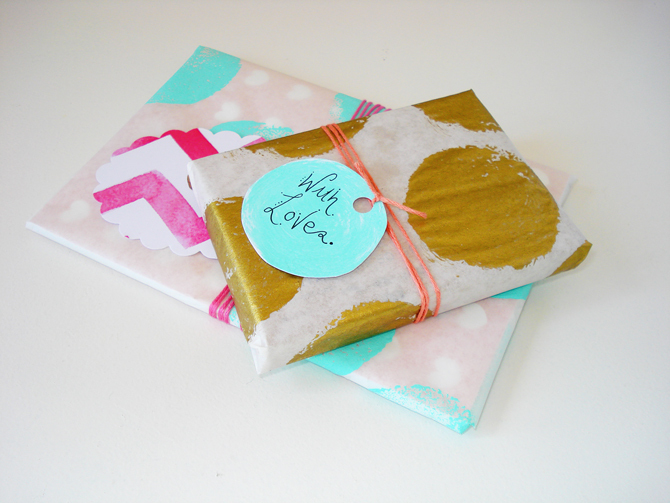 Add some patterns with your sponge and paint - DIY, one of a kind gift wrap. 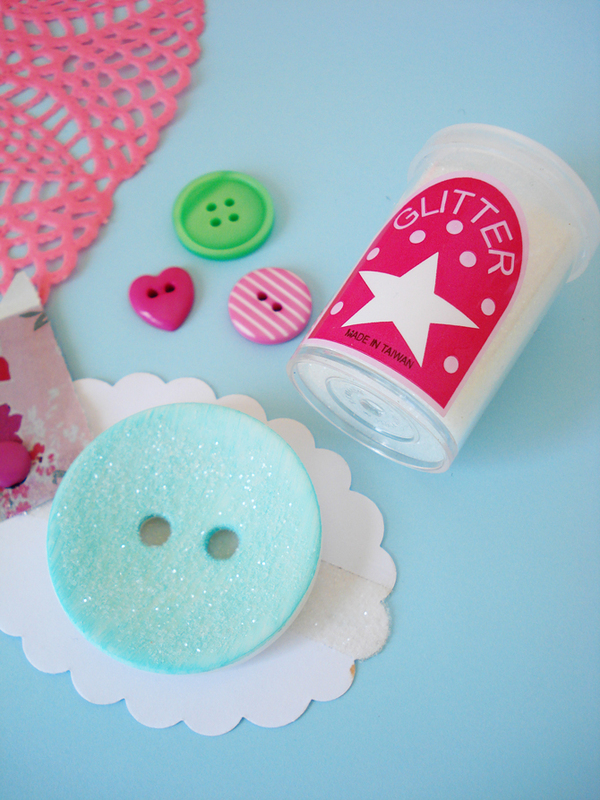 A white button can be painted and then dipped in glitter. The glitter was super cheap at only R8! As I mentioned above you can create your own wrapping paper with paint and a roll of grease-proof paper. I used a sponge from my vitamins to create the circles and the tag is just one of the circles cut out and tied with embroidery thread. More of the grease-proof paper used as plain wrap this time. The tag is painted with the craft paint and I used some fabric scraps to make its little tails. The bambi is a magazine cut-out on some double-sided tape. For unique tag shapes - find an online template and trace it out in a paper of your choice. Happy wrapping friends! I hope you found this post useful! Feel free to leave a comment and share your thrifty tricks.